Property 4: Intimate Log Cabin Studio - Perfection! Cabin Nestled Away in the Sacramento Mountains. Property 5: Cabin Nestled Away in the Sacramento Mountains. High Rolls Cottage w/Mtn Views-8 Mi to Cloudcroft! Property 8: High Rolls Cottage w/Mtn Views-8 Mi to Cloudcroft! Cute 3BR Cloudcroft Cabin w/Stunning Views! 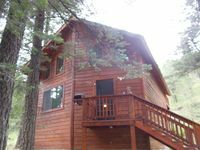 Property 12: Cute 3BR Cloudcroft Cabin w/Stunning Views! Charming Santa Fe Casita on 3 Acre Farm w/Animals! Property 19: Charming Santa Fe Casita on 3 Acre Farm w/Animals! Property 21: Right on the Famous Ruidoso River!!! Beautifully Remodeled, Cozy Home In The Mts. with A/C. Guaranteed you will love! Property 25: Beautifully Remodeled, Cozy Home In The Mts. with A/C. Guaranteed you will love! Peaceful, comfortable and beautiful mountain home away from home. Property 30: Peaceful, comfortable and beautiful mountain home away from home. PET FRIENDLY-cozy cabin near to shopping and Upper Canyon yet off beaten path. Property 32: PET FRIENDLY-cozy cabin near to shopping and Upper Canyon yet off beaten path. Property 36: We Are 20 Miles From The Taos Ski Valley And 1.25 Miles From The Center Of Town. 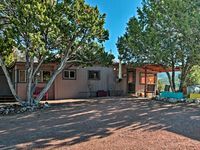 Property 38: Cottage on Rural Southwest NM Ranch, Along Creek! The cabin was great! The scenery was amazing! The whole town and the people were nice. It was as described! Cute. Cute. Cute! Everything was immaculate. It IS AN OLDER CABIN so it had it&rsquo;s quirks. I must tell you. THE BED IS MAGNIFICENT!!! I didn&rsquo;t want to leave that bed!!! Lol. The couch in tv/porch room was almost as nice!!! Everything was charming. Thanks for letting us stay! It also has a lovely view off the back cliff!!! The kitchen and bath were well stocked and very useable! !